Vengeance Sound VPS Scope - "fagjg"
MeterPlugs Ian Shepherd's Dynameter - "Meterplugs Dynameter - an essential aid to mastering. " Hornet Plugins ELM128 - "Loudness for all! 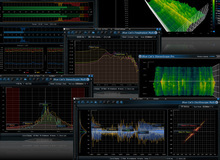 ;)"
Waves GTR Tuner - "Not a bad software tuner"
Waves Dorrough Meter Collection  Surround Edition - "Surround edition"
Waves Dorrough Meter Collection - "Visual monitoring tools for audio"
Waves PAZ Analyzer - "Frequency analyzer"